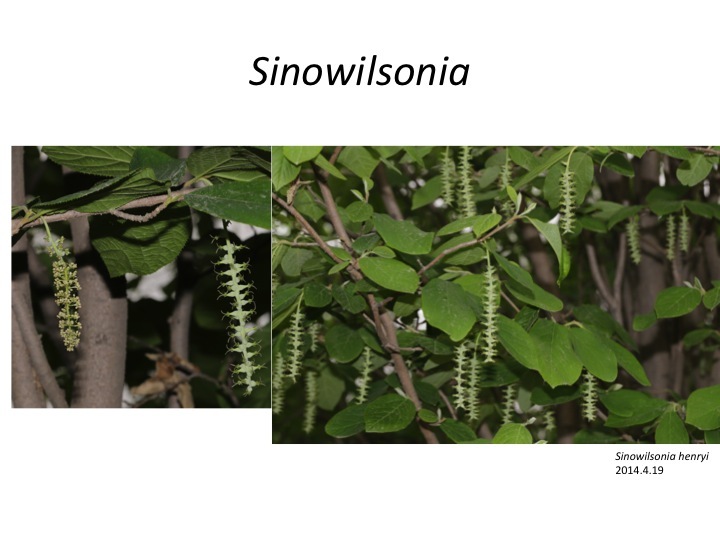 The genus Sinowilsonia belongs to Eustigmateae, Hamamelidoideae, Hamamelidaceae, Saxifragales and is distributed in China. 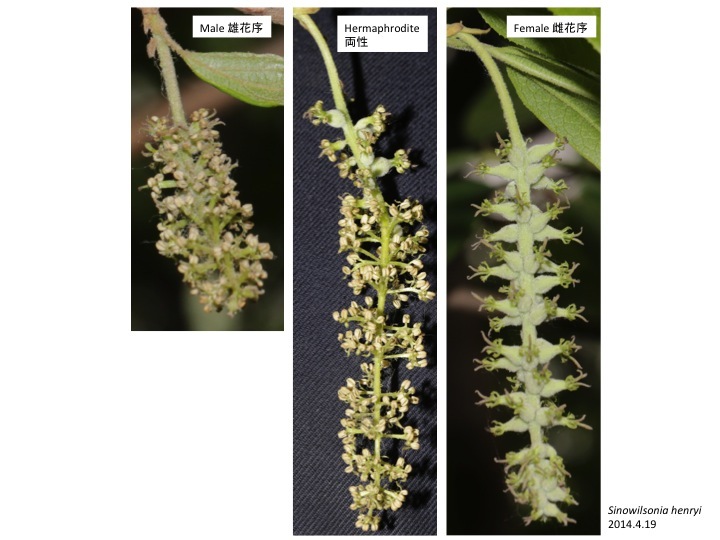 Male, female, and hermaphrodite inflorescences are formed in a tree. Basal 10 flowers are hermaphrodite in a hermaphrodite inflorescence and other flowers are male. All flowers are male in male inflorescences. Each male flower is flattened and each tepal is fused with each stamen in an opposite position. 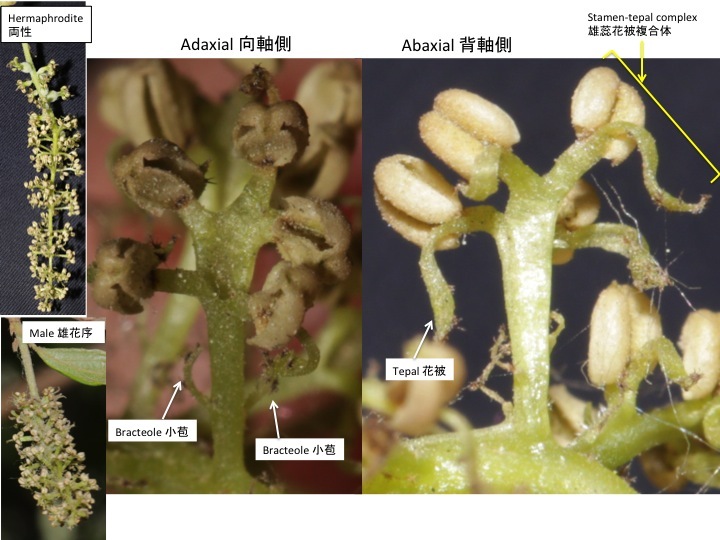 Male inflorescences and flowers of Juglans are flattened and may use similar mechanisms in Sinowilsonia. The mechanism of the flattening may give insight to the “Planation” of the Telome theory (Zimmermann 1953, 1965). Zimmermann, W. 1953. Main results of the “telome theory.” The Palaeobotanist 1: 456-470. Zimmermann, W. 1965. Die Telomtheorie. Gustav Fischer Verlag, Stuttgart. 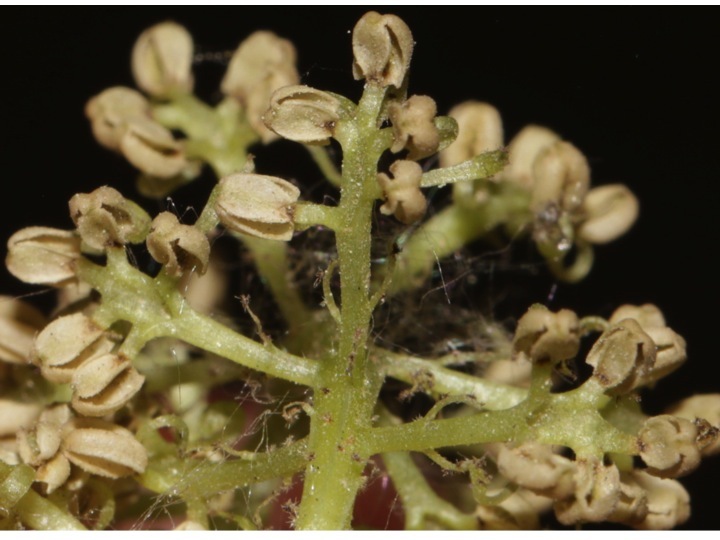 Flattened male flowers in a distal part of a male inflorescence. Approximately 10 flowers are formed at the base of a hermaphrodite inflorescence. Five stamen-tepal complexes are fused to cover gynoecium. Furthermore, a layer of tissue with white hair covers. It is unknown the white tissue is an outer tepal, bracteole, or a bract until we investigate the developmental process and expression patterns of genes involved in these organ development. A female inflorescence is composed of female flowers. 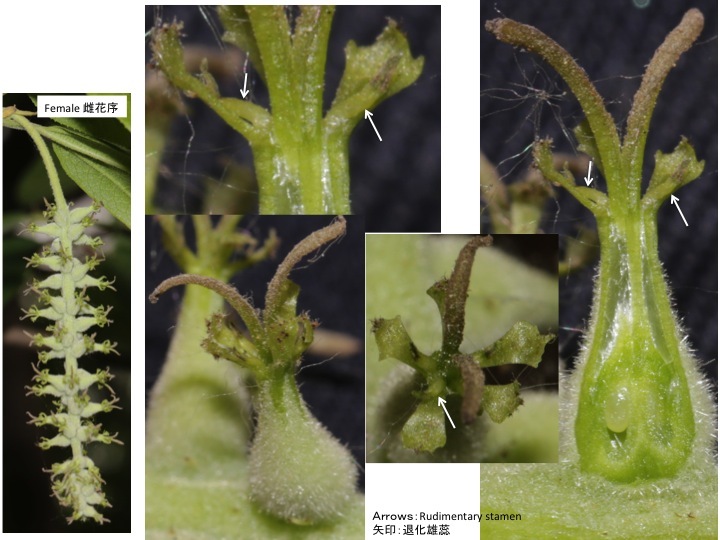 In a female flower, a gynoecium is covered with a fused stamen-tepal complexes and a fused organ covered with white hair as in a hermaphrodite flower. 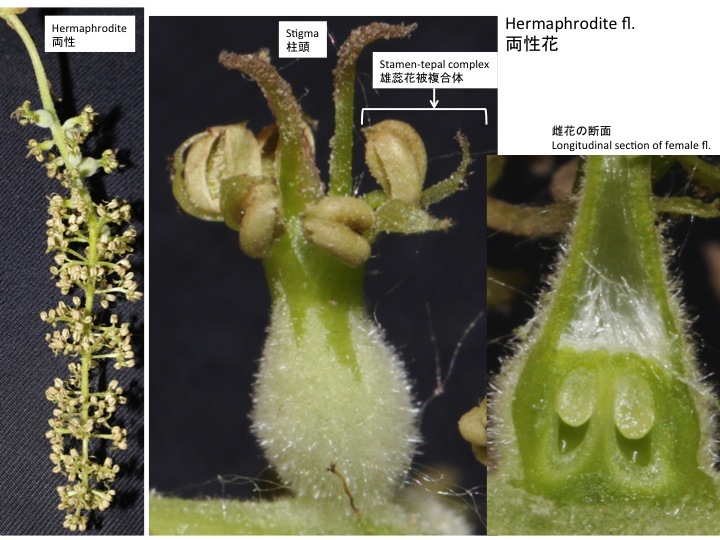 However, anthers are rudimental and shorter filaments than those in hermaphrodite flowers are not fused with tepals. Tepals are bigger and more lobed than those in hermaphrodite flowers. In my opinion, the tissue with white hairs is a bract or a bracteole. There are two reasons: the first one is that there is an inferior ovary; and the second one is that the outside part of the receptacle and the part or side below of the receptacle are as a whole, which shows this layer of tissue is not a part of the flower. Is a small bract called a bracteole or bractlet? If yes, I would like to call it a bracteole. By the way, how can I insert a picture in this comment? Thank you very much for your comment. I think it is hard to identify homology of organs based on their relative positions, because relative positions are changeable in some mutants, such as floral homeotic mutants in which carpels are formed outside of petals. Although there may be constraint in development, it is hard to know at this stage. So I prefer to keep the homology of the white-hair tissue as an open question at this stage. Anyway, think you very much and very nice to hear from you.